Total paddlers 6: 4 x K1, 1 x K2. Air Temp: 7ºC Getting Cold! White navigation lights needed for bow AND stern. Buoyancy aids recommended for all when cold this time of year. If you’re going out alone, always make sure someone knows your whereabouts, what time you expect to return back and that you’ve returned safely. Please note that we do not currently have any formal coaching facilities, so to join in winter training sessions, you already need to be a very competent racing kayak paddler – at least able to paddle a K1 proficiently or have experience as a (stable) crew paddler in a K2. If you’re a racing novice, it’s recommended you wait until the spring and summer months to develop your boat and stability skills in Bristol Harbour – or at least pair up with an experienced paddler who’s prepared to take you out – and preferably during daylight hours. Total paddlers 7: 1 x K1, 3 x K2. Total paddlers 5: 3 x K1, 1 x K2. Next training – Thurs 24/10, 6.15pm. Total paddlers 8: 6 x K1, 1 x K2. Visibility: Clear / Dark – high reflection from ambient light. Highlights: Steve paddling into landing stage (!). Evangelos (aka Evo) standing starts. Top paddlers: Evo! SB! KS! Next training – Tues 22/10, 6.15pm. Connect here via Twitter & Facebook! 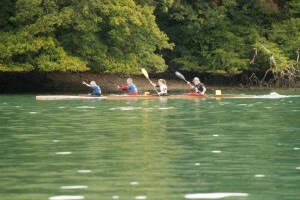 I’ve now set up a Twitter and Facebook Group accounts to network the website online… it’s nothing official as far as the Bristol Canoe Club is concerned, just a way to get connected to other Bristol based marathon, sprint and surf ski racing (ocean) paddlers, BCC club members and visitors alike. Click on this link HERE and request to join group if you haven’t already been invited. Total paddlers 6: 2 x K2 & 2 x K1. Session: Steady to fast, intermittent winter wash hanging and race pace training. Highlights: SB/H in K2 pace setting with MH & LT hanging on. Top K1 performance from KS and Evangelos from Greece we welcome to regular training sessions! Next training – Thurs 17/10, 6.15pm. 1st & 2nd for Bristol Crews at Fowey! Bristol Canoe Club crews, Keith Sanders and Kevin Littlehales took first place, with Steve Bennett and Helen Taylor taking second place in the Division 4, 8 mile K2 race with Tristram Turner and Danielle Clark taking 2nd place in the Div 3/4, 12 mile event at at Sunday’s BCU Hasler Canoe/Kayak Race on the river estuary at Fowey, near St Austell, Cornwall. Bristol paddler Helen Harris and Patrick Starkey (independent – but trains at Bristol) also finished the 4 and 8 mile courses respectively. Great effort from all Bristol paddlers with around a 100 racers . Keith & Kevin take 1st place with Helen and Steve a close 2nd in Div 4. Total paddlers 11: 3 x K2’s & 1 x K1 training together on washes, plus 2 other K2 crews paddling separately, (1 crew member complete novice). 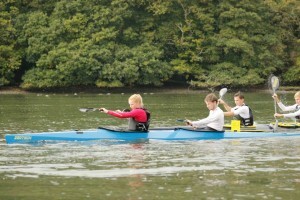 Session: Wash hanging, racing pace training for Fowey at weekend. Highlights: Excellent K2 wash hanging & K1 performance – despite late start for many. Next training – Tues 15/10, 6.15pm. GOOD LUCK GUYS & GALS on Sunday! Fowey Race this weekend. Click for details.